For as long as I have been a ship modeler, I have wanted to create my own carved sculptures for ornamentation on my model. The castings provided by the kit manufacturers were never adequate or contemporary, and lacked the artistic beauty that was reflected on the beautifully ornamented ships we all admire from history. I self taught mysef to carve these beautiful sculptures. 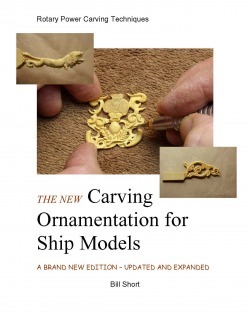 My peer group of ship modelers encouraged me to share my experience and techniques, so in 2002, I committed them to print in my book Carving Ornamentation for Ship Models. Since then I have sold over 800 copies in English and 200 in French around the world. In 2009 I updated the book with nine more pages of content and am now shipping it via email in Adobe PDF form. Please explore the following pages which outline the content and how to order a copy.